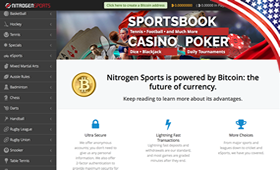 Bank with bitcoin at one of the oldest and most trusted U.S. facing online sportsbooks. Zero fees. Bovada process all bitcoin deposits and withdrawals free of charge. Anonymous accounts are NOT possible. Personal information is required at sign-up. The minimum bitcoin deposit and withdrawal limit is $20. Max withdrawal is $9,500. Bitcoin payouts are a little slow and usually take 1 to 3 days. Deposits are instant. 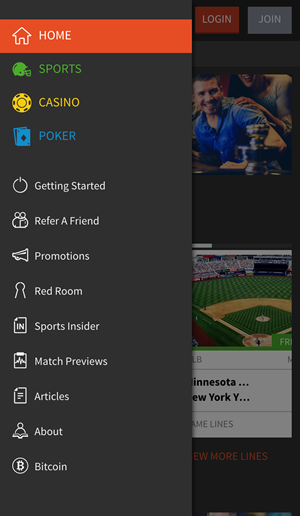 Excellent iOS and Android web apps for sports betting, poker and casino gaming. Get a $250 dollar welcome bonus plus exclusive bitcoin offers and promotions. Bovada is one of the most recognized sports betting sites for United States gamblers. 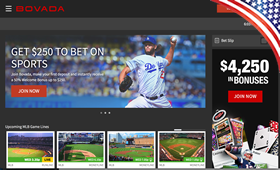 Not only are a lot of American bettors familiar with the Bovada / Bodog name dating back as far as 1998, the site is one of the most heavily advertised in print, radio, and television in the country. Bovada made the name switch from Bodog back in 2011. 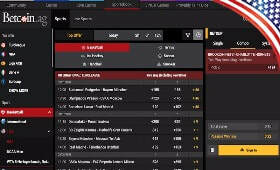 The companies are uniquely intertwined, yet separate with the Bovada brand released exclusively for U.S players. 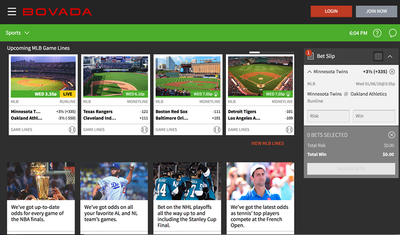 One of the best things about Bovada is that they are a well-established site. There are a lot of anonymous, seemingly sincere bitcoin sportsbooks popping up but there's nothing really stopping them from pulling the plug at any minute. With Bovada, you know they're going to be in it for the long haul so you can feel secure doing your bitcoin wagering with them. Bovada will be one of the easiest sportsbooks to navigate mostly because it's the first sort of layout that people were introduced to back in the day. The web application features the familiar left – center – right layout: On the left hand side you have a rundown of all the sports available including links to the casino, poker room, and horse race betting. In the center is all the available events for that sport and on the right side you'll find the updated betting slip that includes risk / win tables. 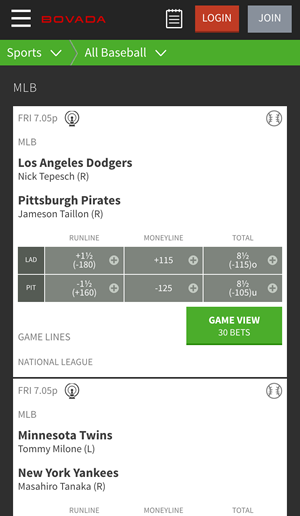 Once you add a second and third game bet to the slip parlay, options become available. Submitting a bet first takes you to a “review your wager” page and once you give that button the OK you're locked in. The top navigational dashboard is also a very informative portal. Your balance, messages, and account info is where you can find all your past, present, and future betting information. As you might expect with an online sportsbook geared towards U.S bettors, every major American sport has a pretty prominent presence on Bovada. Actually, almost every sporting event that is happening on American soil will probably have a line from Bovada and this includes horse races, golf events, boxing and MMA fights, NASCAR races and more. Even things like the 4th of July hot dog eating contest and the political elections can be wagered on. There is also a strong International betting sheet as well including soccer, cricket, handball, Aussie rules football, rugby, darts, and snooker. When you go to deposit via bitcoin, Bovada gives you a unique address to send the money to for privacy reasons. Processing times range from instant up to 15 minutes, which is actually very fast. Some BTC gambling sites require 6 confirmations, which can take well over an hour. In order to qualify for a bitcoin withdrawal you must have made one previous bitcoin deposit (can't go from money transfer to bitcoin for example). Withdrawing to bitcoin requires a 72 hour processing time which isn't ideal, especially in the day and age of instant transfers. 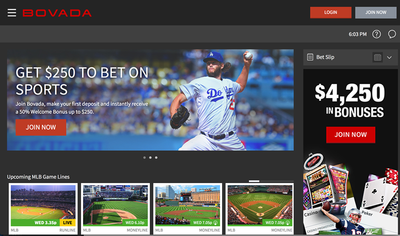 Bovada has one of the best mobile bookmaker experiences of any online sportsbook. Customers can create an account and process their deposits and withdrawals strictly from their smartphone (no computer access needed). In a way, placing a wager is even almost easier via their mobile platform than it is on their website. Lines are presented in a clear and concise manner and clicking on each option takes you to a user-friendly, self-explanatory betting page. There is no download required for the mobile app either and mobile poker and casino games are also available on iPhone, Windows Phone and Android. If you do have questions about bitcoin deposits or about Bovada in general they have a 24/7 help line as well as an e-mail contact form. They also provide bitcoin guides for newbies that will take you through the BTC banking process step-by-step. Bovada does offer a 50% match up to $250 for valid new accounts that are depositing for the first time. Bovada requires a 5X rollover in the sportsbook to claim the bonus, which isn't horrible. Some sportsbooks have been known to deny promotions to bitcoin deposits because of the risk of multiple account scams but this isn't a problem at Bovada. In fact, they run promotions that are only available to bettors who use bitcoin to promote adoption. Choosing to play at Bovada gives you access to three amazing things – 1) a great online and mobile experience, 2) the ability to deposit and withdraw via bitcoin for free, and 3) perhaps most importantly a trusted name. For all intents and purposes, Bovada isn't going anywhere. The company has a proven track record of marketing and reinvesting in their business and you can only assume that's going to continue as betting technologies continue to improve.